Heart rate measurement indicates the soundness of the human cardiovascular system. This project demonstrates a technique to measure the heart rate by sensing the variation of the blood volume inside a finger artery, which is caused by the pumping action of the heart. It consists of an infrared LED that transmits an IR signal through the fingertip of the subject. A part of this infrared light is reflected by the blood cells. The reflected signal is detected by a photo diode sensor. The changing blood volume with heartbeat results in a train of pulses at the output of the photo diode, the magnitude of which is too small to be detected directly by a microcontroller. Therefore, a two-stage, high gain, active low pass filter is designed using two Operational Amplifiers (OpAmps) to filter and amplify the signal to appropriate voltage level so that the pulses can be counted by a microcontroller. The heart rate is displayed on a 3 digit seven segment LED display. The microcontroller used in this project is PIC16F628A. Heart rate is the number of heartbeats per unit of time and is usually expressed in beats per minute (bpm). In adults, a normal heart beats about 60 to 100 times a minute during resting condition. The resting heart rate is directly related to the health and fitness of a person, and hence is important to know. You can measure heart rate at any spot on the body where you can feel a pulse with your fingers. The most common places are wrist and neck. You can count the number of pulses within a certain interval (say 15 sec), and easily determine the heart rate in bpm. 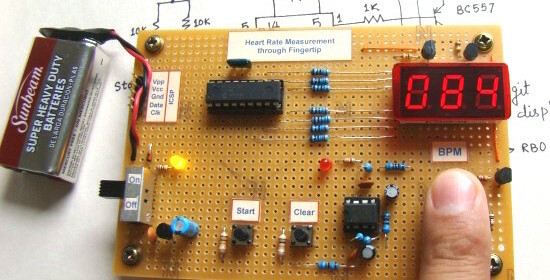 This project describes a microcontroller based heart rate measuement system that uses optical sensors to measure the alteration in blood volume at fingertip with each heart beat. The sensor unit consists of an infrared light-emitting-diode (IR LED) and a photodiode, placed side by side as shown below. The IR diode transmits an infrared light into the fingertip (placed over the sensor unit), and the photodiode senses the portion of the light that is reflected back. The intensity of reflected light depends upon the blood volume inside the fingertip. So, each heart beat slightly alters the amount of reflected infrared light that can be detected by the photodiode. With a proper signal conditioning, this little change in the amplitude of the reflected light can be converted into a pulse. The pulses can be later counted by the microcontroller to determine the heart rate. The signal conditioning circuit consists of two identical active low pass filters with a cut-off frequency of about 2.5 Hz. This means the maximum measurable heart rate is about 150 bpm. The operational amplifier IC used in this circuit is MCP602, a dual OpAmp chip from Microchip. It operates at a single power supply and provides rail-to-rail output swing. The filtering is necessary to block any higher frequency noises present in the signal. The gain of each filter stage is set to 101, giving the total amplification of about 10000. A 1 uF capacitor at the input of each stage is required to block the dc component in the signal. The equations for calculating gain and cut-off frequency of the active low pass filter are shown in the circuit diagram. 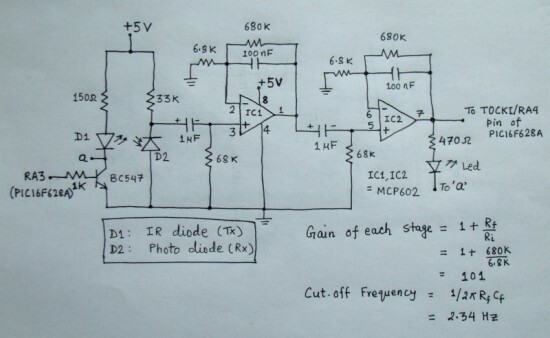 The two stage amplifier/filter provides sufficient gain to boost the weak signal coming from the photo sensor unit and convert it into a pulse. An LED connected at the output blinks every time a heart beat is detected. The output from the signal conditioner goes to the T0CKI input of PIC16F628A. The control and display part of the circuit is shown below. The display unit comprises of a 3-digit, common anode, seven segment module that is driven using multiplexing technique. The segments a-g are driven through PORTB pins RB0-RB6, respectively. The unit’s, ten’s and hundred’s digits are multiplexed with RA2, RA1, and RA0 port pins. A tact switch input is connected to RB7 pin. This is to start the heart rate measurement. Once the start button is pressed, the microcontroller activates the IR transmission in the sensor unit for 15 sec. During this interval, the number of pulses arriving at the T0CKI input is counted. The actual heart rate would be 4 times the count value, and the resolution of measurement would be 4. You can see the IR transmission is controlled through RA3 pin of PIC16F628A. The microcontroller runs at 4.0 MHz using an external crystal. A regulated +5V power supply is derived from an external 9 V battery using an LM7805 regulator IC. The sensor and signal conditioning unit used in this project is improved further and the new design is available for purchase as Easy Pulse (see picture on left). The Easy Pulse sensor is designed for hobby and educational applications to illustrate the principle of photoplethysmography (PPG) as a non-invasive optical technique for detecting cardio-vascular pulse wave from a fingertip. It uses an infrared light source to illuminate the finger on one side, and a photodetector placed on the other side measures the small variations in the transmitted light intensity. The variations in the photodetector signal are related to changes in blood volume inside the tissue. The signal is filtered and amplified to obtain a nice and clean PPG waveform, which is synchronous with the heart beat. The firmware does all the control and computation operation. In order to save the power, the sensor module is not activated continuously. Instead, it is turned on for 15 sec only once the start button is pressed. The pulses arriving at T0CKI are counted through Timer0 module operated in counter mode without prescaler. The complete program written for MikroC compiler is provided below. An assembled HEX file is also available to download. Sir, can you please send me the PCB layout and other circuit details? Sir, I am interested to make this project so please send more details about the protect like circuit diagram,components,programing code etc. Sir , I am interested make this project ,so please send the project PDF and also send circuit diagram, required components , ect. Please send me the source code and full circuit diagram with videos! Which microcontroller should we use? i would be thankful to you.. I am new to this project and am keen to complete it. I am using mikroC and a 16 by 2 LCD display. I am not sure what is happening in your software. Could you possibly help me to understand? I am using nelcor ds100A spo2 sensor,can u provide any code for that to my mail. We have tried the same circuit as it is shown here in this site. But the sensing circuit is not working properly & the readings are in the range of 200-800. Please reply as soon as possible. We need help. can you pls send me the full report of the project. I would like to do the same project for my course. please, as soon as possible. I had try this .But can’t succeeded . My signal amplifier ckt didn’t work . so what should I do now . I used Lm393p in place of mcp602 . so please give me some suggestions for this soon .Hope you will help me . Sir/madam i am an engineering student, i would like to ask you to please sent me the complete project report as soon as possible or at least how the components are connected,i.e. image of that board from back sir please send me. if possible kindly attach the complete c code and PCB layout files. I am Making this project as ISU in my Computer Technology Class. Can somebody please send me the list of all the materials that i need to make this Project. i wish to make an attempt at your project would it be possible for you to email me the list of materials used? sir i want the protus pcb layout of this project and pcb design of this project . the hex file you have given is not run in the protus simulation please guide me . can i measure spo2 from the same ckt used for heart rate measurement ? Couldn’t you take a more instantaneous heat rate by measuring the time between heart beats (the period), taking the inverse to find frequency, and multiply by 60 to find bpm? Then you could use low pass filtering to smooth out the response. Sir if you don’t mind, could you send the parts list, pcb diagram for this project? My email add is diespi85@yahoo.com or diesp85@gmail.com. Thanks a lot! I am trying to build the micro-controller part in Proteus, what would b the input at RA4 ? Hello, can you send me the code in C at my gmail id,please? This is an excellent project and i want to build this project. could I get some more information of the schematic diagram please? did you get the parts list and ckt diagram? can you please send it to me too? hi. i do not have the IC PIC16F628A but i have PIC16F627A. what i know is that they differ in memory. can i use thePIC16F627A in replacement of PIC16F628A. and will it require me to make changes to the program. i also don’t have the IC MPC602 IC i have the LM358. Sir, can you send me the code in C at my email id? please send me the complete circuit diagram and the code. and if possible ares pcb design of this circuit. and how i can use the 16f627a microcontroller together with the lcd display. or how i can use the lm358 instead of MCP602. Good day sir, currently im trying to build this circuit in a breadboard. I would like to ask since there is no availability of the component MCP602, is it okay to use LM324 instead? Though i would have to find the correct pin config but op-amp wise, will it be sufficient to be used for this project? where can i get lth1550 sensor? I am having trouble with the code of this project. I am looking for the source code in C language. Check out my Arduino based project here. sir, im interested with this project. can u please email me all of its components? Greetings sir/madam. I would like to ask sir/madam for the full source code and list of materials for the above project. Your reply will be appreciated. Reply as soon as possible is preferred. can anybody provide the programming code for blood pressure measurement using pic16f877. please post projects on this gmail!!!! i am intrested in your project your project is excelent i want to make this project. please send me project details and its component details as soon as possible. I’m trying to do this project but instead of using a PIC-16F628A, I want to use PIC-16F887. Is it possible? If yes are the I/P and O/P pins for the signal conditioning cct the same? i would like to know if the concept of this project is similar as to that of an ECG? if so, can i use RR interval in detecting the peaks being created by this devices voltages? I am using mcp602 opamp & PIC16F628A Microcontroller, I need complete program & code for this could any1 guide & help me??? I need complete program & code for this could any1 give me??? can someone send me the list of components please! can this be applicable in 16F84A? I was wondering if you got the C program code for this project? I am having trouble locating it. The C code provided here should be compiled with MikroC Pro for PIC compiler. hi, could you please send me the code in C language. im using ATTINY861A for making this. just having a bit of problem write the code in C. for example timer0..? what value am i setting that to? R-b, can i simply replace the IR sensor here with TCRT1000 like the one in this diagram? If you connect the TCRT1000 properly, it would do the job. Please sir or anyone send the full materials for the project including complete circuit diagram. Urgent. i am making this project please send me the full detail of this project. Help me to making this project. any can u help me out to transfer the data from the sensor to android mobile device ? You can send the complete circuit? I did this on a PIC32 and FPGA, but we used digital filtering in the FPGA. Peak finding was a bit tricky. I see your code have variable TMR0=> what is it? And I don’t understand the function of “j” in your code. Can i use 8051 microcontroller instead of pic 16f628a ? if yes could you please send me the code for 8051? What are the necessary changes on the program if we want to use p89v51rd2bn as the microcontroller for this project? Very well project i want to make this projecr for my final year project so please send me all the detail related to this project in my mail id. pls help me for finding other sensors & different other ways for detecting heart beats. may you please send me the full heart rate monitor based on pic 877a schematic. Hello sir really need your help! If i use the easy pulse sensor v1.1 and replace with this circuit by using this code will it works? I think it will work right? 3. If i use easy pulse sensor v1.1 , The input of the circuit is known as enable right? or i must connect to pic pin? I created the PCB project of Heart Rate. The problem though is that by entering the PIC in the circuit and energizing it does not work. I checked the sensor and conditioning circuit works well and also diasplay viewing is done well. The problem is that when I load the file with the programmer gives me an error in the CONFIG WORD. Unchecking it says to write it. Using the software PROGPIC2. Help me. Answer me by email. Thank you very much. Can a zigbee module be added to this sensor circuit so that the results can be transmitted to a computer for further analysis. Can you tell me which LCD have you used? And pls send me the whole code and the circuit design. can you give some clues to make this project to LCD interface?please…. Oye me podrías hechar una mano con el circuito? Hi sir/anyone over here, could you please send me the full explanation/circuit for this project urgently? you can send me the complete circuit of the project? hi.i’m from korea. i really want your project. so please Please send me details of your project……. GOOD WORK! COULD you please give the specific numbers identifying the IR and the photo diode. we cant just pick any. help. urgent please. Please Sir, i would like to know if we could use PIC16F877A for this project. please help me about the software intallation in PIC16F628A, i am unable to do this pls help me by step by step process. awaiting for your reply.please send me details as soon as possible. pls sir send the full materials for the project including complete circuit diagram. I need this project document can someone send me this document please ? I need this projects component list ,so please help me with that. Can I use the LM358 in signal conditioning part and IC chip 89S51 as micro-controller part in the same circuit. ohkay.. so i made the above design but i want to use it ATMEGA MCU not PIC controller. Im giving the output to the ADC of the controller and it not working right. Am i suppose to give the output of the conditioning circuit to the RX pin? Or to any other pin as a digital input? Would you please guide me with that? Sir..can I get the complete circuit that build using ISIS? because I used this for my final project..
I’m begging u..I have face some problem when I built using ISIS..
sir,I build the Microcontroller and Display Circuit using Isis 7 professional. can u send me a complete circuit using ISIS, if you please? Sir,can u send me a complete circuit using ISIS? i am using mled. separately it is working.but when i connected in the circuit it s not working.please help me. You can take the BL600 Bluetooth Low Energy programmable module from Laird and replace the PIC with it. You then program it using BASIC language to to all the sensing and calculations. Then instead of displaying it, it sends the data wirelessly which can then be displayed/logged etc on an iPhone or any Bluetooth Smart Ready phone or tablet. The BL600 BLE module is not that expensive in 1-off quantities either and can be bought from many distributors. Hello,Can I Get Name Of All Component Uses In This Project. nice idea, i like it … just wanted to ask u, is it possible to place the sensor at the foot or at the leg ? or it only work the best with the finger tip ? Sir can i directly use SPO2 probe instead of IR sensor. Or can i send o/p signal to the GSM module instead of using 7-segment display? The MCP6004/2 are not readily available where I live. Can i construct the signal conditioning circuits using an LM358 ? Yes, you can use LM358. Can any one help me to make this type of project instead of using finger probe I want to use piezoelectric sensor does the input frequency remains the same? plz help my email is sa4shery@gmail.com thanks! 1. common anode 10 pins is not available in market , kon pin D0, D1,D2, abcdefg i dont indicate its. please help me as soon. I have a 7 segment display has 10 pins input. which pin is D0,D1,D2 and a,b,c,d,e,f,g of the ” 3 digit common cathode 7 segment display (HX04301BHB)” , 10 pins ? I beg to send data to complete because the final project in my college. Hello. I’m willing to do a similar project in your project. Please send me details of your project. If anyone send you details so will you please send me. hey can we do this project using an atmega128 development board? If some one can help me with the layout please. Can replace MCP602 with Op-Amp 741 , if we can how configure 741 as active low pass filters with a cut-off frequency of about 2.5 Hz ?? can I get any help from anybody , please ?? sir please give me the component details……….. as soon as possible. Sir, i like this project very much & wish to do it. so please give me the component details used in the circuit as soon as possible. Hello, may i have your project’s full details about listing of components and PCB Layout? This will be my email address, huisan1990@live.com.my. I will b grateful if u can send me as fast as possible. Thanks a lot sir. DEAR SIR PLEASE TALE ME DISPLAY SEGMENT NUMBER AND PROCESS OF USING LT542 DISPLAY IN THIS CIRCUIT ????? hello sir, how will i put the c program into my ic?? R-B the said you can use LM358 as an OP AMP instate of mcp602. did anyone try that and worked? can i use 16F84A pic instead of using this pic? The sensor successfully detected my heart rate; but, there was only a few mV at the pin TOCKI which is equivalent no output. can u tel me equivalent for mcp602. I wont get it. plz reply me..
Sir, instead of PIC can i use msp430 as microcontroller? And if I do can you tell me what changes I need to make in this circuit? dear sir, i hv found that there is only one LED in your schematics diagram but there is 2LEDs in your picture.Could you please explain to me…coz im a newbie in this field..? sir,, i have questions about the sensor part of your project.. Thanks for this project. I am going to build this at home. Can you sent the full wiring details of your prototype? I cant see how you soldered behind on your breakout board. Please sent me underside picture of the breakout board. how to get the output on the laptop rather than on lcd screen ?? Sir,i am beginner in electronic engineering,my question is,why use the dual op amp with dc supply to amplify instead of ac supply? Thanks for this project and i made this and working well. i took the sensor circuit and connected the o/p to CD4026 counter display driver IC because don’t have PIC. from 555 timer gave a pulse after 1 min to the counter IC to stop counting. there you are heart beat monitor without a PIC. sir , can i use pic 16f877a , in this project ?? Hello, I am intending to do this project.Can you help me with the BOQ of the items I’m gonna need? Why would you reject my previous message where I exposed my doubts? Hi, I have several questions about the circuit you developed. 1st: You say that the filters are low-pass filters but they cut the DC component of the signal… how can a low-pass filter block the DC component if they let the low frequency signals to pass by (DC component is aproximately 0 Hz)? 2nd: Why do you use a 33? resistor in series with the photo sensor and a 150? in series with the IR transmitter? 3rd: Why using two filters if one is just fine for doing the filtering job? You probably will tell me that it’s important using two of them because of the amplification (A=101*101?10000), but the signal is perfectly “visible”, it comes out of the photo diode in the order of Volts, or am I wrong? 4rd: Why using a 100nF capacitor in parallel with Rf? Just to increase the order of the filter in one unit? I’m waiting for your answer. Thanks! i have chose heart rate measurement using fingertip as my mini project.fortunately got your thesis,i have done the hardware part but stuck with software as i want to interface lcd and pic but unable to get it.will u help me in software part?? i ll post the code which i have used soon. eagerly waiting for your reply because i have only 4 days time. can i ask the complete detail of the components? like the voltage of the capacitors used and what kind of IR diode. Instead of using the micro controller to read pulses, can i use an analog to digital converter ? I was planning to set a threshold value high enough to detect only the peaks. When the digital value exceeds that limit then a counter is incremented. At the end of 15secs, the present count value * 4 Should give me the heart rate ! Will this work ? I am a complete retard and moron like all the other people visiting this website. If you would be so kind to go out and buy all the parts, then design a PCB, and of course don’t forget to assemble it and adequately test it. When you finished, please write me a report, minimum 20 pages. Oh and btw send it to me in doc format so I can fill in my name. My project was due 2 days ago, so it would be great if you just hurried up. Oh and please rewrite the code to be cross compatible between PIC and Atmel and Stellaris and Windows and Mac. Unix is optional. I can’t pay for postage because I am a poor student with wealthy parents, but please deliver it to my front door. And while you are here, please make some dinner and read me a night time sleep story. Please hurry. It is really really urgent. Then please send me some money so I can build it. AND I built it, but it don’t work. Can you tell me why? I put one finger in my ear and one finger up my nose, and it still don’t work. PS: IF ANY MORON READS THIS, READ IT CAREFULLY! THIS IS A SIMPLE DESIGN, WITH A SIMPLE CIRCUIT. IF YOU HAVE NO IDEA ON HOW TO CONSTRUCT SUCH ASSIGNMENT FOR YOUR UNI PROJECT, THEN YOU SHOULD NOT BE IN CLASS! THE CONTENTS AND INFORMATION PROVIDED HERE SHOULD BE UNDERSTOOD BY FIRST AND SECOND YEAR UNI STUDENTS. STOP ASKING USELESS QUESTIONS AND TRY TO USE YOUR LITTLE BRAIN. YOUR BRAIN IS THERE TO USE AS A THINKING DEVICE. IF YOU STILL DON’T UNDERSTAND IT, QUIT UNI OR COLLEGE NOW! YOU ARE WASTING A LOT OF TIME! IT IS ANNOYING READING SO MANY USELESS COMMENTS!!! Why did u use an active low pass filter?can I use a band pass filter as an average human heartrate lies between 60 to 100 bpm?? Why not use continuous signal? Why you should use the alternating signal? hello, just wondering if the circuit works on a 9v or 12v power supply?why did you choose 5v? I was made this project completely. but it doesn’t work. and the IR not any current. do you mind if you send the PCB lay out to me..please. How can I build this program In “PIC18F4520” …. I Face Some Hardness !!!!! 1]Can you tell me the difference between and HEART RATE & PULSE RATE? 2]Can we measure Hear rate using Red Led and LDR?like placing finger on LED?? Hi RB, Is there any way i can simulate this project in proteus 7.7 design suite. Thanx. is there any other way to build this project without the OPAMP because i couldn’t find it. Sir can u let me no which pins are D0,D1 and D2 of LEDs used in dis project. N m using lt542 ..so which pins corresponds to dem? Dear Sir,I want to measure the heartbeat along with the detection of blood oxygen saturation using this same project…What should I do then?? olha eu to querendo desenvolver esse projeto vc poderia me imformar quanto vc gasto nesse projeto com componentes e tudo mais? Would it be possible make this project without the 3-digit output by removing the connections to the microcontroller and grounding after the LED rather than connecting to ‘a’? This is for a lab for my AP Physics class and neither my lab partner nor I understand the coding for the microprocessor. I’m willing to leave learning that for another day if I can manage to make the LED flash with the pulse. Sorry i’ve another quiz !! plz what the point ‘a’ mentioned in the first circuit refer to ?! please send my list of components and tell me if i can use PIC 16F877A instead of your PIC? Can I change this PIC16F628A to a 18 series pic in this same project..? Hello everyone, I am a student ITIS electronics section. I really like this project and I would like to do for the dissertation. 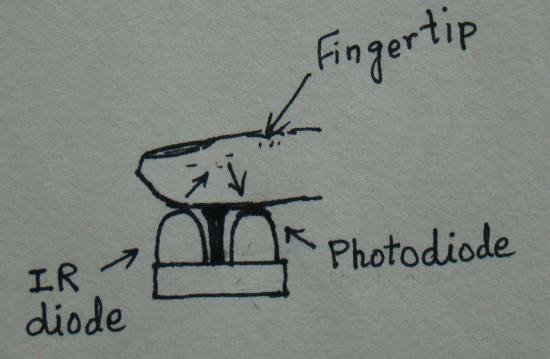 I only have a little curiosity to ask: I want to know what kind of Photodiode and IR diode did you use for the Place finger! Thank you all for your, hoped, help! can you email me the details of this project! i made all things that u show on the diagram and the blanking conditions but the led doesnt blink with heartbeats whats wrong? Any ideas on what might be happening there? If it makes any difference I’m using an LM317 which was the only opamp in DIP I had at hand. Hey , thanks for this wonderful project. Works really fine and runs with ease.. but have to improvise.. the sennsor was not available .. so have to make our own. Except for that everythinng is okay and we used a pot instead of 150 ohm resistor. Also i am getting ultra high results on seven segment display like 400 or more…I redid the circuit third time but nothing changes. Hi,i have the same problem with farhang,i am using lm358 and tcrt1000 and everything else is same with what you have used..Any suggestions? whoops.. pardon for what i said about RA5 about it being the pulse source. I meant pulse input. lol.. My program is still a mess and forgot to clean it up before posting it here. ‘Removed start and clear buttons. My coworker and I did this project yesterday. Works great! But I made the program from scratch. Instead of counting the number of pulses in 15 secs, the PIC measures the time delay between each pulse and converts it to BPM, that way we can have an instant reading. That’s great! Can you share it with us? 1) i couldnt find the MCP602 so i used the LM358 as you indicated in your comments and i wanna ask if it works as good as the MCP602, and should i change any values in the circuit ? 2) i am using pic16f887 and the disable comparators instruction gives an error, what should i do ? 3) this might be stupid, but is a photodiode same as a photodetector ? i want pcb design for this project…. pls send to me RB…. I solve problem with flickering, also with PICKit2 “Enable Code Protect”, problem is in microcontroller type. Code is written for PIC16F628A and I was try to program and use PIC16F628. I change in MikroC microcontroller to PIC16F628, compile, program and all works fine. I solve this problem, I program with different programmer and solve this. PICKit2 works without error and problems with others firmwares. I try several different HEX and all work nice. But this firmware I cant program to microcontroller, and I try to recompile source in MikroC and the same result I get. I dont catch why “Code Protect” is enabled, I check in MikroC all protection are disabled. When I put PIC16F628 in socket and turn on circuit, I get “0” flickering on all 3 digit for several seconds and then turn off. Hi, i am thinking to give a try for this project,can you give me specific details for component list and circuitry? Thanks. You can mail me,if you would like to help. Sir, can you tell me, which sensor you used here? I tried the same circuit with a simple photo-diode. but am not getting any output. If i move the ir led around the photo-diode, the red led at the o/p terminal blinks sometym. i dont understand what you mean about ic1 and ic2…. Sorry, ther’s only 1 IC. 1 and 2 actually refer to two Opamps inside MCP602. You can use LM358 instead. But I have a doubt. I want to make this same circuit but using LDR and LED (red high intensity) to detect the heartbeat, do you know if it could work? Or do you think that photodiode is better? Can you send me which photodiode and led did you use? I have built this project using IR204-A and PT202B-13, but the response is very poor.. Just wanted to know whether is it not possible to built the circuit using these diodes. There’s only one IC and which is MCP602. It has two OpAmps. You can replace it with LM358. It should work just fine using LM358. i have made this project..signaling parting was working perfectly but as i connected the controller part there is no response on 7segment as well as the the LED part for signaling also stopped…tried a lot but couldn’t sort it out…what would be the problem any idea R.B??? if u didn’t replied me i will be failed in my project. can we use 8051 microcontroler instead of PIC16F628A? hey R-B..i want to merge this with spo2..is der any equation for this?? how to measure HR and spo2 by a singl hardware?? plz guide me..
PROJECT IS GOOD,i got a problem with 7-segment ..the 3 digit 7segment which i am using is a 12 pin 7segment..couldn’t find the data sheet of it..datasheet for 4 digit is easily available so can i use 4 digit 7 segment? that is when we use it in the counter mode it either counts by either rising edge or falling edge of the pulse.i think u selected rising edge by making TOCS bit “0”. Then how the micro controller counting both rising and falling pulses??? other thing is i’m not able to get a gud protecting material for the sensor part,how u get/make it? hey R-B,i already posted earlier that i need ur help. PLZ R-B REPLY ME QUICKLY. I am unable to measure any of the parameters that you are asking for because I did this project long time ago and I don’t have the original board now. I would rather suggest to use TCRT1000 reflective optical sensor to do this project. My name is Ali and i’m from Pakistan. There is a question in my mind about the pictures you have posted of your project. In the circuit diagram you have mentioned two mcp602 but in the picture only one IC can be seen.. why is it so ? my name id richard grodzik and live across the pond on a small island called Britain. constructed the front end of your heart monitor (the finger probe) just using the opamp circuitry with a small mod).i.e. 2 ir LEDS in parallel with a 33R current limiting resistor. just finished the project,connecting the probe to an MBED ARM controller and a backlit LCD. That’s great! Can we see some pictures of your finished project? It would be nice to see your MBED version. it seems to be a nice work, im implementing this circuit on proteus but unable to get any output, if you have any schematic implemented on any software.. then please send it to me. i wnt this heart rate monitoring project but i wnt to do some advanced in that means additional parameter want to detect 2 or 3 i.e.phonocardiogram and echocardiogram…. so give me idea and basic information about how to implement this project……. hey, can u plz guide me how to make heart rate and spo2 sensor widout using micro controller..plz do mail me as soon as psbl..m making my project based on dis only..its very much urgent.. I am very grateful for the help. Thank you! I really admire your designs, congratulations! But when trying to build the heart frequency monitored described above found some difficulties. The biggest one is to find a photo diode to construct the sensor, since we here in Brazil we are very sofendo pirated components. I wonder if it is possible to use the microchip sensor tcrt1000. I await response. I am going to post a revised version of this project in next couple days. Guess what? The revised version uses the TCRT1000 sensor. Marc plzzz specify where is the components list on this page? There’s no list of components provided in the article but you can create one by yourself from the circuit diagram. FYI, I am posting a revised version of this project in next few days with more specified components. I would suggest you to wait until then. Amiel Sapilan, the materials dude is on the page, just read the page completly! Sir i want to see the signal from D2 and the out put. Hi sir, i would like to know the function of the 1k resistor and the BC547 BJT which are connected to your microcontroller. And if i’m using 8051 F330 micro controller, do i need the BJT and resistor? I would like to know what kind of LED Display u have used.I am going to use a Kingbright BA56-11SEKWA (0.56inch).Do u think it will work the same? Hi sir, to add on to the previous question, can’t we use a one-stage filter instead of 2? No, a single stage LPF is not enough to boost the signal from the IR sensor. Do they work as filters as well? HI sir, may i know the purpose of each of the stages of the two-stage amplifier? do they both have the same purpose of amplifying the signal or there is a different purpose for those two? They are both active low pass filter. The two stages are required to boost the gain up to 10000. Hi! I rode the circuit by changing the MCP602 op amp for the LM 358. The circuit and the display are working perfectly. However, the LED emission and reception are not doing the measurement, because the red LED does not blink, indicating the frequency of cardiac pulsation. Do you have any idea what would be the problem? Would the LM358 op amp? Or could it be otherwise? Thank you in advance for your help. Thank you! I’m planning to build an oximeter. I’ve looked at your circuitry, its simple and I was hoping to build my oximeter using your circuitry. For an oximeter, 2 LEDs–red and infrared are to be used. Do you know of any photodetector that can recieve both wavelengths of light? Or do i have to buy 2 different photodetectors? Also, for the Red and Infrared LED, do i connect them in series in the same circuit or design 2 different circuits for both LEDs? I can’t tell anything on modifying this project to make an Oximeter. I would rather research on this topic to get more info. Hi sir. I mounted this circuit and followed all your instructions.. the sensor unit works fine but when I try the whole circuit with the 16F628A programmed with the hex file you gave us, the displays show 000 for all the time and if I change stat to the RB7 pin nothing happens.. Displays should show 000 for only few seconds following the program but they stay so until I remove supply.. I’m panic because I have to make this project to work before 20th june. Please reply me. watch it when u make comments like that.. this project works fine. there is no problem with anythn, retrace ur work, u shud be able to find the faults. the led not blinking neither the result is right so the wrong is with the code…. i need ur advice plz coz i have no time??? Can I use three single seven segment to compose a 3-digit seven segment without chancing the code? To do this, do I need to change the code? You don’t have to change the code for using three separate CA displays. so wut should i do? thank u sir! i figure it out.. but sir.why there is no mention about RA4 in the coding? just initialize the port only? I’ve followed the steps and built the same circuit and hardware wise it’s working fine. I’m using LPC1769 microcontroller to code and am not too sure on how the pulses are counted. could you please explain a little more on how the pulses could be counted? Sir,u have any hex files for pic16f877a.can teach me how to change the code,i and using LCD display.very confusion to change it. It’s described in the text. so can i replace it in micro controller in 16F877A?? how can i connect i/p pulse in 3 no. port of the microcontroller?? Hi, please, i have downloads the last version of MikroC and try to compile the program, and it return some errors, how can i fix it please? i dont understand mask in this coding.. sir.could explain it.. I am glad you figured the things out. Also in signal conditioning circuit,to generate the pulses you have used 150Ohms with IRLED..will that value changes with respect to different persons finger..because i’m not getting the pulses for certain people..please suggest me regarding this..
How to configure 4 Mhz and for the MCLR to be enabled? And there’s an error when i try to build the codes. Any idea how i could solve it? I plan to do this for my project. Can you pls provide me the hardware list? It would be really helpful 🙂 You can email to jenny_baby13@hotmail.com Thanks! what are IC1 and IC2? after i press reset, the display goes ‘off’.. and the sensor also goes off.. so the pulse led does not blink.. if i press start after that, the sensor does nt switch on..
i have to cut-off the supply, switch it on and then press ‘start’ again..
Hi It’s a great project! About the project, I wonder if there is the possibility of changing the MCP602 op amp on the other? If so, what would be an operational amplifier similar? Thank you in advance. Thank you. could there be a problem with my MCLR pin?? is it possible for only that pin to go faulty?? i have to cut-off the suply, switch it on and then press ‘start’ again..
not able to figure out why this is happening.. There is another point in the circuit far on the right side which is labeled as ‘a’ too. These two must be connected. dear rb sir, in the circuit diagram at ir diode & led what does ‘a’ mean where it has to be connected..
What kind of object did you put on it that makes it count? The circuit is a low pass filter and if you wave your hand in front of the sensor, it will count that. That’s why you put your finger still so that it will response only to the changes in the blood volume. i’m new in electronic. i would like to build up this project. can i ask u that in your Microcontroller and Display Circuit, there got D0,D1 and D2. may i ask which diode is it?? and also, inside the circuit, i can’t define out which is led in yellow colour but inside your picture and video got the led in yellow colour. everythng works fine in my circuit but this.. where do you thnk i shud look at?? Reset will reset the MCU and restart it. I can’t tell you without looking at the circuit because it is very straightforward and should work. What happens when you press Reset? Can I use PIC24H for this project instead of PIC16F628A? Does your sensor work outside in sunlight? I’m not sure if sunlight is intense enough to affect the sensor through a finger or if my closure is leaking in light. the device stops working after i hit reset, i will have to switch off the main and then switch it on..
You should check your circuit. sir i completed my circuitry my signal conditioning part is running but nothing going display . how can i check PIC is well programed or working & how can i check it in multimeter. please any one help me, am not able to solve the problem,when i am compling the c program of this project it showing me the error like NEW TEXT DOCUMEN.C(7): error C202: ‘RA3_bit’: undefined identifier. if any one knows it please help me..i am using Keil uVision2 software for compling. The program is supposed to be compiled with mikroC Pro for PIC. if i press reset button and hit start after that.. nthng happens..
What programmer are you using? You can use PICkit2 or PICkit3 to load the program. Search for it online. WHEN I LOADED THE .HEX FILE WHICH IS GIVEN BY YOU IN TO THE PIC16F628A MC. IT SHOWING THAT THERE IS A FUSE ERROR.PLEASE HELP ME FINAL SEMINAR IS ON 30TH APRIL. Can i use BC557 instead of BC547??? If not what other transisitor can i use instead of BC547??? tried the changes with display.. as the value of ‘j’ is increased the 7-segment display time increases.. j=3 sets display time to around 8-9 secs..
what does clear actually do? it runs the program form the begining is it? nthng happens when i press the clear button..
Clear is actually RESET button. My project includes heartbeat measurement.. In addition to that it senses body temperature untill everything is fine.. In case temp increases 38 degrees(higher than normal)..
OR heartbeat increases 110 bpm..
it will automatically send sms to a predefined no. (perhaps a doctor) using an android phone..
we have designed an android app dat does rest of the job..
ti have used an LCD to display the value .. but the value displayed is nt right.. i am getting vague values.. pleas help! I got microstick pic24h and I tried couple of examples using MPLAB IDE. Can you give more details on how to debug the code by using MICKRO PRO C into the microstick. SInce the article provides source and Hex files directly. Not sure or can’t find a way to download these files to the hardware. Or should I change the code that is compatible with MPLAB IDE and PIC24H ?? Thankyou for sharing the details of ur project in such a brilliant way.. Besides that i have added some control circuitry to connect an android phone and send sms to the doctor in case heartbeat increases normal level..
To check out my project click the link below..
That’s really cool. Would you mind sharing more details of your project? That is an awesome project. I would like to develop it with PIC24H microstick and using MPLAB IDE, can u please mention what all the changes should I do in terms of components such as resistors, transistors, power supply. Can I use three individual 7 segment display. Will u please mail me the component list. can I use 6″ modular IC Breadboard Socket ?? I’m am trying to do this project on a pic24 which needs a 3.3v source. I’ll still be powering everything else with 5v, but I was wondering if I would still be able to use the BC557s and BC547 and the same resistors. sir i am using pic 16f84a and the code is giving me errors so do i have to make changes in the code because i changed the pic? I want place a buzzer in this project. Buzzer turn on when heart rate isn’t Between numbers 60 to 100. ( the normal heart rate is Between numbers 60 to 100).for example when 7segment display 59 or 101, buzzer get turn on). You need a PIC programmer (such as PICKIT 2) to do that. I made the project heart rate measurement from fingertip and I was succeeded. I want place a buzzer on this project, when heart rat display: below 60 and above 100. Can you help me? When Start is pressed the I/P pin is grounded externally. See the circuit diagram. Dear R-B sir,can i use 8051microcontroller instead of PIC16F628A..
what do i have to do now?? i mean will it still work?? sir i am using pic 16f84a and the code is giving me errors so do i have to change in the code because i changed the pic? i am using mikroC, and i copied the program !! but when i press “build program” it says…. ‘;’expected but IR_Tx found …. what do i have to do?? Did you copy and paste the program from the page or you downloaded the source code .ZIP file? Dear R-B sir, if i want to add pulse oximeter on this project, then what would be the change in calculation and coding? can you send me the coding? Sorry I don’t have one. How do you load software? Tks R-B,I have another Question Is :the minimum coefficient Of Amplifier ? Can I use “MCP6002” replace with “MCP602”? You can try. It should probably work. I’m modelling my heart rate monitor after your circuit, and I can’t seem to get it to work! Hello! I’ve been reading your website for some time now and finally got the bravery to go ahead and give you a shout out from Humble Tx! Just wanted to mention keep up the fantastic work! will surely let you know, i shall do all the changes and let u know how the chnges reflect..
i have another problem R-B, i havn undertood the display() function in your progrM,the for loop part,y is i=180 and j=3…how did you set these values on what basis? The for loop continues until i = 180*j (=3). During this time the measured heart rate will show on the display. After i = 180*j, the display is turned OFF to save battery power. If you want to prolong the display time, you can increase the value of j. You can try and let me know the output. i shall do that, if iam not using start and reset for this ” led toggling” program, MCLR should be disabled right? and i have another confusion,i have downloaded mikroc evaluation version but do not have the program burner from mikroelectronika… i have a universal burner… i can burn the program using universal burner but cannot configure the pic.. what can i do about tis?? i wrote a simple toggling program in mikroc and burnt it into pic using universal burner, but dint get the desired output because the PIC was not configured…. how do i do this sir?? i really appreciate your advice..
Did you configure PIC in the mikroC compiler. You can do it from Project->Edit Project window. Recompile the project after configuring PIC in mikroC and load the HEX file using the universal programmer. hello, I need to do a project,exactly like this one, the only exception is that in mine I dont need a PIC,so my question is: does the lack of pic,it changes the answer of the circuit? or if you can help to implement the circuit without a pic. Thank you. thank you…& also thanks about explaining the use of switch case in the program. Would let you know when this project is completed & runs successfully for me..
oh thanks a lot for your reply Sir. Ya, figured it out that its not possible to use digital panel meter so instead am trying it out with three individual 7-segment display… will that be ok..?? i want to interface this output to the PC (serial communication) making use of USART, do i have to go for a bigger pin microcontroller (28pin)? If you get rid of the seven segment LED display then you will have plenty of pins left for serial interface with a PC. 2. )Also, in the program given by you, I am unable to understand the purpose of the switch cases used.Could you please explain me what is their significance.Please…. To display a particular digit on a seven segment LED, you need to turn on the appropriate LEDs. Based on digits 0-9, the case statement returns the appropriate value for PORTB to to turn on the corresponding LEDs. Firstly, would like to thank you for providing us with such a wonderful project & that too with every possible detail. 1.) Sir, for the display part, is it ok 2 use a digital panel meter i.e. PM-129A (its 4 digit actually), i am not able to figure out how to connect it.B’coz I am unable to find a 3 digit 7-seg module. You can’t replace the seven segment display with a panel meter in this project. sir, please mail me the full component in this project(junior_boyz92@yahoo.com) ASAP..thanks! @r-b ..sir i need ur email id..can u give?? why is j=3 and looping done 180*j times? Hi guys, just a quastion: what is the name of the 3 digit display??? on which pin number of the three digit display the emitter terminals coming from the diodes557-D0 D1 D2 goes. how can i connect three seven segment CA display in order to represent three digit number. ignore my last post, its MikroC..
i finally got it to blink with proper sensitivity.i want to know which software was used to build this program? can u tell me which s/w was used? we are using three single seven segment display,so can you tell us how the connection will change?? we are using three single seven segment display,so can you tell us how the connection will change? the code was written using which software? and which c compiler have you used? i am using the latest version from microchip (MPLAB) and Hi-tech c compiler, few notations are different.. The code was written for mikroC Pro for PIC. Hello sir, I get a maximum output of 1.7V only after the amplification. Is it enough to trigger the T0CKI pin to activate the counter ? I currently get no reading from the counter..
i got an MCP602, ordered it.i have built the circuit two to three times on the bread board.. i am using the sensor from tayda as mentioned by you.. i am having one problem, the led in series with 470 ohm switches on when i give the supply and switches off within few seconds.. the sensor is not able to pick up the pulses, however a slight contact at the junction of 33k and electrolytic capacitor makes the led blink..
so the circuit seems to be fine i suppose? i have also tried adjusting the pot(2k pot as mentioned by @Goebish), the led does not blink on placing the finger? My monitor did not work w/ my index finger but works just fine using my pinky finger. ALso the TCRT5000and it worked fine but very sensitive, I use 965Ohm in series with the IR diode side. Seemed like a lot but it works. I got the monitor to work. it just flashed me sir, m using all 1/2 watt resistors .. does that matter? shud i use 1/4 watt? 1/2 W resistors should not create any problem. m sorry, its not the power on led, its the led that is in series with 470ohm resistor..
i got an MCP602, ordered it.i have built the circuit two to three times on the bread board.. i am using the sensor from tayda as mentioned by you.. i am having one problem, the power on led switches on when i give the supply and switches off within few seconds.. the sensor is not able to pick up the pulses, however a slight contact at the junction of 33k and electrolytic capacitor makes the led blink..
Hello sir, can you give the above code for MPlab IDE ? sir we tried burning the pic with the hexcode provided in your link but it shows error(fuse error) everytime..as far as we know the pic is working properly.we are in the midway of our project. kindly help asap..
1-can i use mcp601 op-amp instead of mcp602? Hi, seem to have problems making the TCRT5000 work with this circuit. please can you look at my circuit and see if everything is correct. here is the link – http://www.mediafire.com/?paa2jpadbsv65c4 .Also do i have to feed the circuit to an analog port on the micro controller or i can feed it to any port on the micro controller. First of all, thanks a ton for putting this up, it’s very well explained and has been been extremely helpful for someone fairly new to electronics. I have a question. I’m finding the sensor to be fairly sensitive and unreliable, and I think that the culprits are a) changes in ambient light, and b) movement of my finger (or, as I would like to get working: my wrist). Do you think that the sensor would work significantly better by replacing the photodiode with an infrared photodiode, something like this: http://uk.farnell.com/sharp/gp1ux301qs/photodiode-ir-detector/dp/1243866 ? 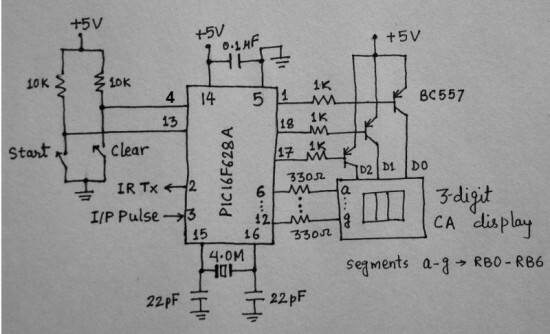 I’m also considering using something like a photodiode-amplifier and dc-restoration circuit in order to block out ambient light changes – anything to make it more robust and less noisy, since I want to make a wrist device that might move around occasionally. The photodiode used in the project is already a IR type. The one you showed should work too. But, the problem is that, i can not find TCRT5000L in local market. and it is not available on taydaelectronics either…. sir,thanks 4 ur project..i m currently working on it…i wanted to ask is it possible to implement the project in proteas software…if yes then then how to show dat u have touched the sensor…nd in the software the pic micro-controller doesnt have 14 nd 5th pin is it inbuilt waitin 4 ur reply. Would it be possible to change this code to use the arduino uno for the microprocessor instead of the chip currently being used in this design and what kind of code changes would have to made? Maybe you could do a step by step of how the code reads the information. I’ve got all the digits to light. Problem was just a loose connection. Still can not get a reading. The TCRT is not picking up any pulses. Any ideas? first i would love to thank you for this great work..
using the TCRT5000. The led is not blinking, the photo diode is on though but seems like the base of the transitor side is not picking up the input. Any ideas? I’ve got this circuit complete. When I push the start button after 15 seconds digit 2 and 3 show 00. WHne I push clear digit 2 adn 3 show 00. My led is not lighting up on the amplifier circuit. I’m using the TCRT and not sure if I’m connected them correctly. I’ve connected A to the cathode, not sure how to connect teh transistor part of the TCRT. If you can please advise. Thanks. if the input signal is given and tested in CRO,what type of waveform i will get..? Can i use lm741 instead of 358..? Different blood volume reflect different amount of light. This change in the intensity of reflected light is detected by photodiode. my display is not working .. my all the connectons are ok…….. cane u tell me wath is my problm?? The 1uF/68K Ohm filter at the “+” input of each OP Amps is surely a high-pass one with cut-off freq 2.34 Hz. Because of the 100nF capacitors, signals with higher frequency is less amplified. thank u sir….. .. for the p[revious question…..
and through which point i will connect i/p pulse in 3 no. port of the microcontroller??….. and is the program and hex codes u have attached is correct???????? I only see 1 led on the schematic, where does the other go? Other LED is power on indicator. The filter should be low-pass. But in the picture, it looks like a high-pass one? Can i use the BC 547 in place of the BC557? Yes, they are same point. DO i just donwload the hex file to my pic or do i do all the files in the link you posted, “Download Source and HEX files”. Thanks. Sir which ic i can insted of mcp602 ?? Will 1/4 watt resistors work ok w/this circuit? can i use PIC16F628 not PIC16F628A ? You have to recompile the source code for PIC16F628. 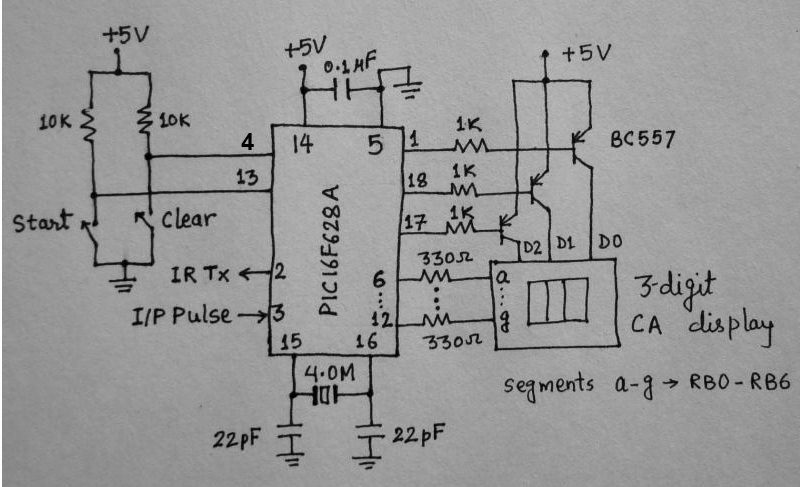 is it possible to use µa741op-amp? any other alternatives to mcp602? can i use another microcontroller such as PIC16F877A? sir R-B i have finished the heart rate sensor system schematic without the 7-Segment and i used 150ohm resistor but haven’t tried lowering it cause it already blinks at 150 ^_^, though you still haven’t answered my question if the variable pulserate holds the 1/4th of the actual value..
nevertheless i will be mutliplying the pulserate by 4 as in your countpulse() function and saving the value to the EEPROM..
You learn more when you try to figure out a problem by yourself. I am glad you are progressing with your project. The answers to your earlier questions are in my tutorials on seven segment displays and EEPROM. 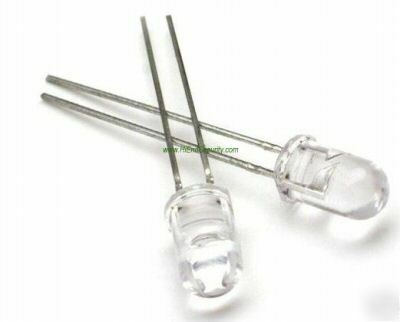 I confirm the “Reflective Optical Sensor 950nm TCRT5000L” from tayda electronics works very well, the only thing is that you have to replace the 150omhs resistor with 68omhs + a 2K pot in series. can you tell me where i can find , in our life, in devices that i can get it from it. I have a difficult to find the photodiode, where i can find it? in devices??? if it was in a our life device for example???!! What are the 4 screws on the edges holding? How about a pic of the underside? Buying my parts for this project tomorrow. i am also planning to but this “Reflective Optical Sensor 950nm TCRT5000L” from tayda electronics as suggested by you.. will this work fine for this project? it costs me about 220Rs, i estimated it on their website.. just want to ensure before buying.. I haven’t tried it personally, but it should work. sir, if i use three single digit display at a place of three digits display.so in single digit seven segment display which are the D0 pin, d1 pin, d2 pin . sir i have noticed something else, i have not yet placed my finger at 2 sensors and even if i removed the source of the IR diode the LED blinks already does this mean i have to place a BC547 transistor placed at the ground part of the photo diode and controlled by another PORT of the micro controller? so that when a pulse test will begins.. neither the two will start without the control of the micro controller. the variable pulserate contains the exact value that RB0 to RB6 outputs? does the resistance from the source to the IR lead affect beats per minute? built the test ckt to find out the frequency of the waveform that we are dealing with.. but all i got was noise.. i read some of your posts which mentioned about different resistance values (150 ohm in series with ir led) , which depends on the ir led specifications.. what specifications are you talking about? and are we suppose to get a square w/f across d2 (otherwise measured after signal conditioning at pin 7 of ic2) ? figured that one out. Still don’t know what 4.0M means though. 4.0M stands for 4 MHz crystal oscillator. What is BC557 and what is the 4.0M by the PIC? Thanks. sir R-B thank you for the EEPROM tutorial.. it was nice..
the pulse rate basing from your program, please kindly check.. The 470 ohms pot in your circuit. I had no 470 at home so I tried a 1K but it was not enough. I prefer to keep it in the final design so I can still tune it if necessary. @duane_dickey: you can build it on a breadboard, but you don’t only need parts, a PIC programmer is also required (eg: PICKIT3). This is really impressive. You said you used a 2K pot. instead of 1K. Which 1K potentiometer were you actually pointing to in my circuit? As opposed to a printed board I mean. I’ll have to make this on a bread board, correct? @R-B, I did use the TCRT5000L from http://www.taydaelectronics.com/ , it works very well, I just had to use an higher resistance, 1K pot was not enough to get the best sensibility, I use a 2K one. Thanks again for the sensor circuit and explanations ! Nice job! What IR module did you use in your project? Therefore, what would be the normal, maximum and minimum heart rate measurement range if you have decided to include the information as i have stated? op amp, low pass filter or the ir sensors? Newbie here. I’m going to try to make this project. Do i just follow the schematic above to get my parts list? Thanks. My name is nava and I am a final year student of Beng Electrical and Electronic.I would like to ask your help in order to check whether there is any problem with my circuit diagram and my programming code since i have modified the project on my own.In hardware side, it works fine but i could not simulate it on the proteus and i suspect that there might be problem on the circuit that i may have overlooked.If there is no problems,then only i can do etching process. I have attached the related info @ http://www.mediafire.com/?v1suh1fzi19tqyu. The circuit looks good except you put Optocoupler in place of sensor module which I think is just for illustrative purpose. If it works in hardware, then why do you worry about it. I think you should move on. Can you send me some pictures of your hardware and results? I have a question about your circuit.The pin 4 of the opamp(-5v) is connected to the ground and the ground is connected to the negative part of the 9v battery.so, the negative 9v and 5v is connected to the ground.As far as i know, we cannot connect negative 5v with ground, rite? If we did so,there will be floating voltage and it would affect the heart rate measurement, rite? All grounds are to be made common for this circuit to work. @R-B : I added a link to this page on my youtube video description. I have built the sensor tonight ( http://www.youtube.com/watch?v=5FfIKVzYqbk ) then interfaced it with an Arduino with a few lines of code. Works fine, thanks ! Would you please explain a little bit more about the sensor you used so that others could also gain from it. Thanks! hopingly you will help us if we face any problem.. I programmed another PIC and now RA3 pin is providing base bias to transistor. Base voltage=0.7V. But still the LED is not blinking and there is no output as well. Please, help me out at your earliest. No, LED doesn’t blink in either case i.e. if feedback is given OR LED grounded. How can I check whether PIC is working or not? Should I program another PIC? In heart rate measurement circuit,when I give the feedback from LED to collector of BC547 or when I connect LED to ground,my transmitting photodiode does not work,but when I give the feedback as well as ground the LED,photodiode works.What could be the problem here?Please reply. This is because the PIC is not working. The PIC microcontroller should turn the RA3 pin high while measuring the heart rate. When RA3 is high, the BC547 transistor conducts and provides ground to pin ‘a’, which will turn the photodiode on too. If you directly ground terminal ‘a’ (both LED and photodiode) then does the LED blink when you place finger on the sensor assembly? No..LED is not blinking and even the nothing is getting displayed on display… I have checked all the connections and are correct…. how should I find the fault? 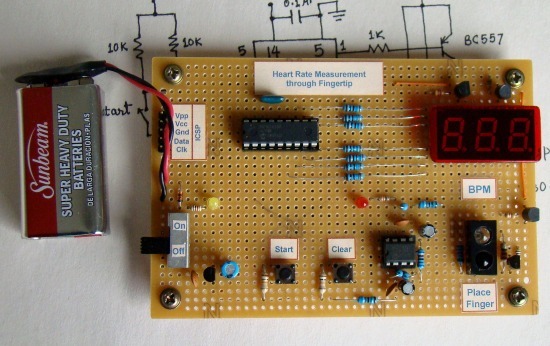 I have implemented your heart rate measurement circuit. I have burned the HEX file given by you on IC. But, is there any other setting (Fuse setting) required as we were told at the shop. Please reply. The program should work without any changes. Do you see LED blinking? Sir, I have burned the HEX file given by you on IC. But, is there any other setting (Fuse setting) required as we were told at the shop. Please reply. Sir, I implemented the circuit. But neither my LED is blinking and nor the displays are giving output. I checked all my connections and are OK. Can you please suggest me the method of troubleshooting my the circuit? Where could be the fault? OK thank you. I’ve fixed the problem i thought it was the lm358. but it was a mistake i misplaced a resistor for another on my bread board.it really works. i don’t know if I’m violating any agreement for the use of this site i suppose this is not a forum where i post threads but rather a comment text box.i really don’t know the difference anyway. but please I’ll like to ask all me questions through this method. conditional gone micro programming remaining thank you SIRE!! and happy new year in AD. The connection of microcontroller from pin 6 to 12 via 330ohm resistors is to be done to the display from a to h or pin 1 to 10? for eg. pin6 is to be connected to seg a or to pin 1 of display(LT543). Pins 6 through 10 of the microcontroller should connect to segments ‘a’ through ‘f’, and ‘dp’ (g) of seven segment module. Is there anybody who making this curcuit with TCRT5000L sensor?I tried to work this system with this sensor but i couldnt work the system.I cant get the heart rate bliking to red led which used in this curcuit.The sensor dont sense the heart rate from fingertip.If i moved my fingertip on top of the sensor,the sensor sensed it and red led blinking but i put my fingertip on the sensor without moving red led didnt blink. I changed resistor which placed infront of the IR TX(150 ohm) with a 220 ohm potentiometer but i couldnt get led blinking which varied with heartrate. i really av interest in this work and av proposed it as aproject topic.av studied the work and also gone tru all the questions and answers provided.they av really increased my understanding. what program is suitable 4 opening the Source and HEX files.what is the difference betw the complete program written for MikroC compiler and An assembled HEX file which is also available to download. The download folder has both source (PulseMeter.c) and compiled and assembled HEX file (PulseMeter.HEX) too. This project is so interesting. where i can buy/find the “opaque material” that you used to surround two LEDs. I found some solid plastic and drilled holes in it. Can you please tell me that which is the program from pulserate.asm & pulserate.c? OR is it the combination of two? How can I combine them to use as a single program? There is only one program which is pulserate.c, which is written and compiled with MikroC Pro for PIC compiler. pulserate.asm and pulserate.HEX are the assembly and HEX outputs generated by the compiler. Only pulserate.HEX is to be loaded into the microcontroller. I forgot that part but it could still be used to amplify the signal to appropriate level that is accepted as logic 1 by the microcontroller. If I don’t find MCP602, I would try LM358. are the IR led and photodiode strong enough sensors to measure the bpm through the finger?? IR LED and photodiode are good enough to detect the variation in blood volume inside finger arteries. It the Op-Amp stage that amplifies the signal by 10000 times to make it strong. 1) are it possible if i want to change 7 segment dispaly with 16×2 LCD ?? 2. I don’t have a code for that but look at my tutorials on PIC, where you will find one on LCD interfacing. 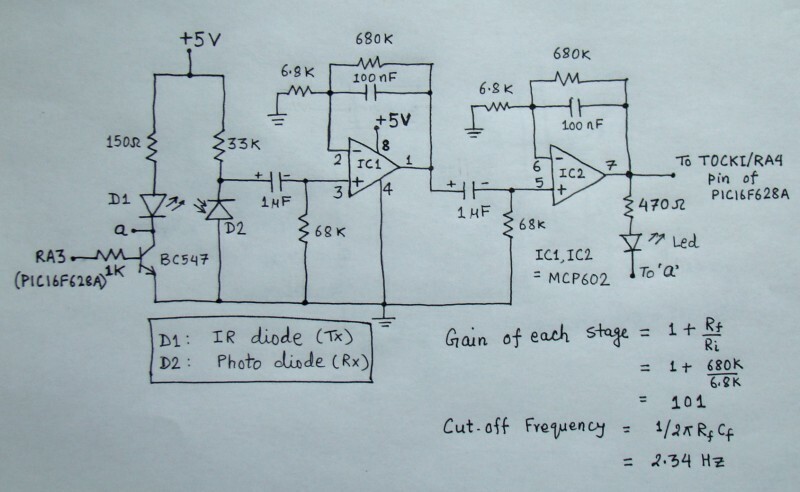 At once thanks a lot for sharing this project with us.i’m doing this project for my lecture.i have questions about this circuit.One of them i buy TCRT5000L – OPTICAL SENSOR and i do this project with it.i cant understand this:TCRT5000L has transistor output.Have i use to BC547 transistor?i dont know it because TCRT5000L has transistor i think perhaps this transistor used instead of BC547. My second question: Are 150ohm and 33kohm enough for this optical sensor? TCRT5000L has transistor output but you can’t use it as a normal transistor as you don’t have access to its base terminal. It should be used as a normal photodiode. For Sure.. I’m happy share the stuff…. But let me say that i’ve made it complicated with 7447 decoder ICs and using separate ports for each digit, just to save the programming part… I’ll post the things here soon (how can i?) or shall i mail you the stuff?? You can email me the document to admin (at) embedded-lab.com. We would love to see your version using BCD to seven segment decoders. HOW much rupees we spend for this circuit? Thank You… I’ve Successfully implemented the same project using an 89c51 microcontroller and your analog circuitry…. 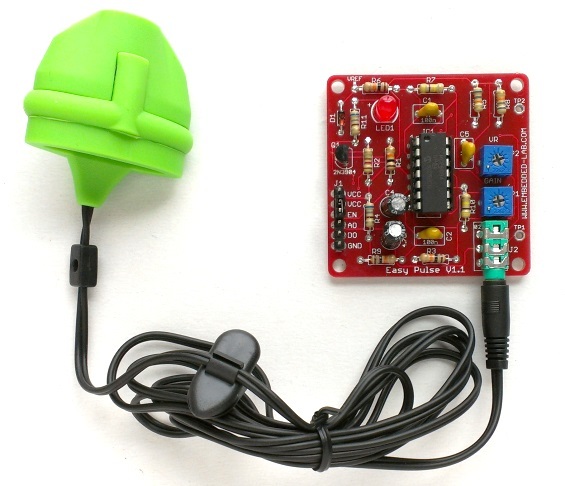 It’s glad to know that you have successfully made this project with 89C51 microcontroller. Would you like to share your version of the project here so that others will find it helpful too? how do i check that???? my 7 segment display is not counting . it shows 888 at the beginning and when i clear it. It shows 000. LED blinks on a regular interval but the counter doesn’t count……. what do u think is wrong???? Check at your Timer0 input if pulses are arriving. Do I need to modify the code since I’m using a 4 digit 7-segment LCD display ? The one I use is CA. I checked the code and set it to work on 4 MHz oscillationm, but when I try to make it work, the circuit give me false results and sometimes upside down. What do you think ? If you connect the LED segments and three digit select pins correctly, you don’t have to modify code. Check your connections and make sure they are right. The HEX file provided in the zipped folder is correct. Check your circuit connections and make sure everything is ok. Try a LED flashing program first to see if the PIC is actually running. sir, which another amplifier I can use instead of MCP602. Sir, can I use PIC16F688 micro-controller for this project??? Will PIC16F688 have enough pins for it? Sir, great tutorial can i share on my own website? Yes, you can share a brief summary of it on your website and provide a link to the original site for the full description. How can i simulate this circuit?? I am currently trying to build the test circuit portion of this design using LM358. Whenever I try this exact set up, my beat indication LED stays on and does not blink no matter if I place my finger on the sensors or not or if I adjust the voltage on the IR LED. What is my problem? In my setup GAIN is 10000 and cutoff frequency is 2.82 Hz. You can use any programmer to load the HEX file into PIC microcontroller. plus what program did you use to upload the HEX file to the microcontroller ? I’m using PICkit2, but I think I’m having a difficulty to do it, as the program freezes everytime I try to make it. Thanks. I managed to build the circuit without any voltage drop or short circuits. I have some questions, I’m using a 7-segments LED CA with 4 digits display “thats Young Sun Model: YSD-439AK2B-35”, Following the datasheet, I connected everything as shown in you schematic, but the display does not show anything. I’m using a 4 MHz crystal and didn’t modify the C file. Another question is, is it normal that when I place my finger on the sensor, the LED will blink once first before I push the start button ? Yes, the LED will blink when you first bring your finger near the sensor. This is because the motion of the finger creates a very low frequency AC signal. Check your connections to make sure that the circuit is setup correctly. I would first try a test program to display a static number on the three seven segment LED display to check the circuit is OK.
hello, now I have project to make heart beat measurement from finger trip but the measurement must be show in mobile phone. I’m comfused to make it. can you help me? my blog diagram is the first, with use sensor and then data from sensor will converted use microprocessor. after that, data will be sent to mobile phone use serial communication and application in mobile phone will be showed the data. I am making the above project. Please can u help me by giving ur advice!!! I really liked the way the circuit worked on our side. I tried to follow the same steps you did, and tried to build it in my workshop by first making the circuit and trying to adjust the proper resistance using potentiometer. The problem is that I have a volte drop when I apply a 5V from the power supply. I checked the circuit but to me everything seemed ok and based on the schematics. What do you think sir ? Thank you. I can’t tell without looking at the actual circuit. Make sure there are no short circuits in your circuit setup. The yellow LED is just a power on indicator and has nothing to do with the operational circuit. if yes,what should i do? sir, is the program in the file pulsemeter.asm…is this compatible with pic 16F628A??? Main source file is pulsemeter.c. The compiled HEX file that you need to load into PIC16F628A is pulsemeter.hex. sir i cant get the code..its not in the proper format!! can u mail it to karan_sinha46@yahoo.com!! Its urgent and very necessary. i have taken this project as my minor project but im not able to get the program. Im using 16F628A microcontroller…can u please tell me the program for that…ill be very grateful to u….and that will help me with my minor project also. The PIC program for this project is available for download from the link provided at the end of the Software section. Which the second IC other than microcontroller in the actual working ckt shown? Can you pl provide the program in assembly language? What is the difference between the microntroller used here and AT89C2051/52? just wanna ask if I can use LM741 instead of MCP602? For the heart rate measurement through the finger i know the pluses is counted by the micro-controller you listed that the actual heart beat is 4 times the pluses output, why is it 4 times? is it because of the micro-controller? This is because the microcontroller counts the pulses for 15 sec and so you have to multiply the count by 4 to determine the heart rate per minute (60 sec). I want to ask one more thing that the frequency that we r considering, 2.5 Hz, is it no more related to which frequencies we want to pass through which we r getting from d output of Photo diode? Do we have to pass all the frequencies? The reason for selecting cut-off frequency of 2.5 Hz is to enhance the Signal-to-Noise ratio at the output of OpAmp by filtering out any high frequency noise in the signal coming from the photo diode. Could you please tell me that how have you decided that 2.5 Hz frequency will give maximum of 150bpm. How to decide which frequency is to be used? Please reply, It’s very urgent. 2.5 Hz is 2.5 pulses per second, which means 2.5 * 60 = 150 pulses per minute. where can i get the datasheet for the 3digit display. coz i dont knw where to connect a-g. and the transistor. Every LED display module has its own pin diagram. You need to find the manufacturer’s datasheet for it. Search online. thank you,it’s a cool project. I do like the pulse sensors and looks like the way to go but rhey maybe little hard to get hold of as it looks like they were a project for someone which needed funding and they reached there target. May have to wait until some more are made and in stock. Thats a good find thx. It indicates you can sew it into material so if its able to obtain a pulse from under you arm it may be a option to sew it into my ipod arm strap. Do you think there would be a way to amplify the signal so it could be strong enough to be used in a Pic? Pulse can be measured at various parts of body by sensing the fluctuation of blood volume inside arteries. The blood volume is fluctuating because the heart is pumping blood into the arteries at each beat. The same concept is applied to sense pulse from ear. Was looking at building something into a arm-strap, like the ones you get to hold an Ipod. Would this LED pick up a heartbeat from the inside or your arm or does it have to be a finger? I would also like something which records the heartbeat continuously over a long period of time and measure max, min etc. Then would like to after workout plug into pc and be able to put data onto some sought of chart. This would mean you be able to see progress achieved over time. Does this sound visible and would this project be able to achieve this? disregard my last post….i already got it..tnahk u… i just want 2 know how did u get a 5v supply from the 9v battery? …I’m working on this project but the code has really an error..
What error did you find in the code? It would be helpful for rest of us to know about it. sir what does O/P mean in the last diagram? O/P is output of signal conditioning stage, and it will go to the pin 3 (Timer0 input) of PIC16F628A. You can use 4 digit LED module and leave the 4th digit CC or CA pin as open. I have an idea to apply your system to detect the micro size of fluorescent-labeled particle in micro channel. Could you suggest optical system and IC which is fine enough to detect in micro scale. Thank you for your kind corresponding. please , can u provide us with a circuit diagram of the above said project as we are doing in our college…. in the above mentioned e-mail id…. The circuit diagram is available in the article. have you tried to use java language or vb.net 2008 instead of using mikroC compiler in your code? i forgot to ask if you tried to use your code in java language or vb.net 2008?